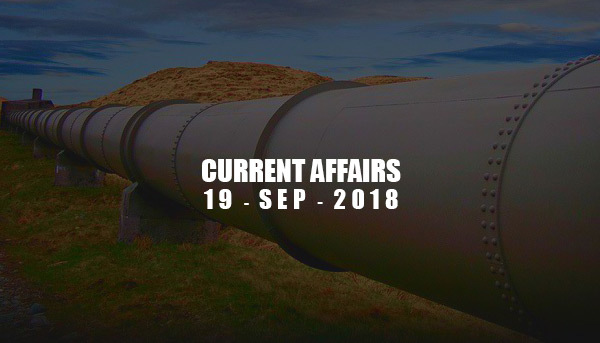 Current Affairs - Sep 19, 2018 - IAS - Daily Current Affairs, IAS Syllabus Exam Strategy, IAS Preparation. e-Sahaj is a portal launched by the Ministry of Home Affairs. It will enable individuals and private companies to submit the application for security clearances and view its status online. The Home ministry is the nodal authority for granting security clearances in certain sensitive sectors. India-Bangladesh has launched construction of 130 km long India Bangladesh Friendship Pipeline Project. It will supply 2.5 lakh tonnes of refined diesel yearly to Parbatipur depot from Numaligarh of Assam in India, later it will be increased to 4 lakh tonnes. The project cost is estimated to be Rs. 346 crore and to be completed in 30 months. 6 km of the pipeline is to be constructed on Indian side while remaining 124 kilometers will in Bangladesh. Defense Acquisition Council has approved the procurement of new upgraded Akash Missile System. Defense Acquisition Council (DAC) was set up in 2001, it is headed by Defense Minister. DAC is the apex defense procurements decision-making body in India. These upgraded Akash Missiles are indigenously built Short Range Surface to Air Missile (SRSAM) System by Bharat Dynamics Limited. It has a range of 25 km and can engage multiple targets (fighter jets and other incoming missiles) at a time in all weather conditions. India and Germany have signed a memorandum of agreement (MoA) to focus on the field of dual vocational education and training and skill development. Under the MoA, students who complete specific training courses in India will get a certificate that is recognized in India and in Germany too. These students can apply for jobs in India and also in Germany. India became world's first country to have documented Cooling Action Plan, developed and released by the Ministry of Environment, Forests and Climate Change. India Cooling Action Plan aims to provide sustainable cooling while keeping in mind, at the same time, the need to protect the ozone layer from substances that can deplete it. It was released earlier on Ozone Day i.e. 16 September. (v) Training and certification of 100,000 servicing sector technicians by the year 2022-23, in synergy with Skill India Mission. (v) Develop an R&D innovation ecosystem for indigenous development of alternative technologies. "Keep Cool and Carry on”: The Montreal Protocol is the theme of 24th World Ozone Day celebrations. The Montreal Protocol is the only environmental treaty which enjoys universal ratification of 197 UN numbers countries. The Montreal Protocol on Substances that Deplete the Ozone Layer has been recognized as the most successful international environment treaty in history.